• Yarn color(s) of choice! I started by making the tassels. I did 4 of them, one for each corner of the ends of the scarf. You want to start by figuring out how long you want them to be. Mine were about 3.5 inches long. 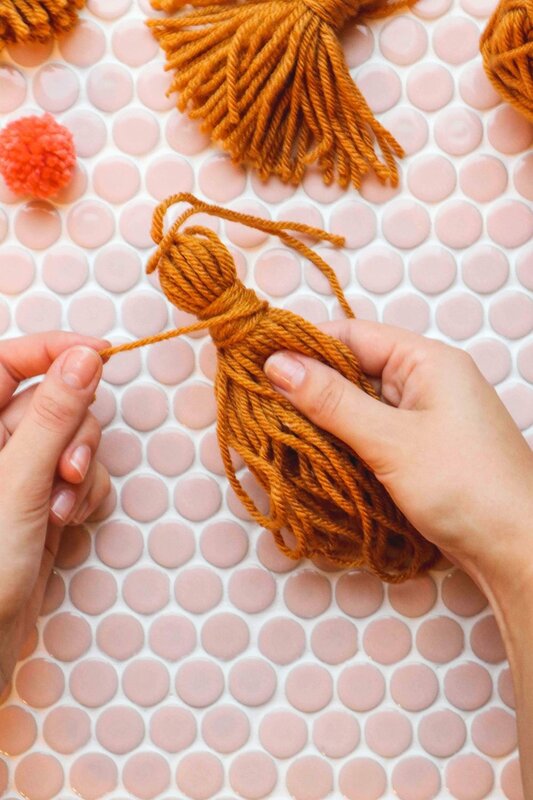 You will want to pull out a strand of yarn that is double that length (roughly). So once you have that length figured out, measure out a strand that length and then fold it in half. Continue to do that, measure a strand, then fold in half. I did it about 35(ish) times. Once you do that, fold the whole bunch in half. Then tie a knot in the middle with a short piece of yarn. Then bunch the strands together so they aren't on two separate sides anymore. Then tie around the bunch about 1 inch down with a long strand of yard (about 2 feet). Wrap around a few times till you are satisfied with the wrap around thickness. 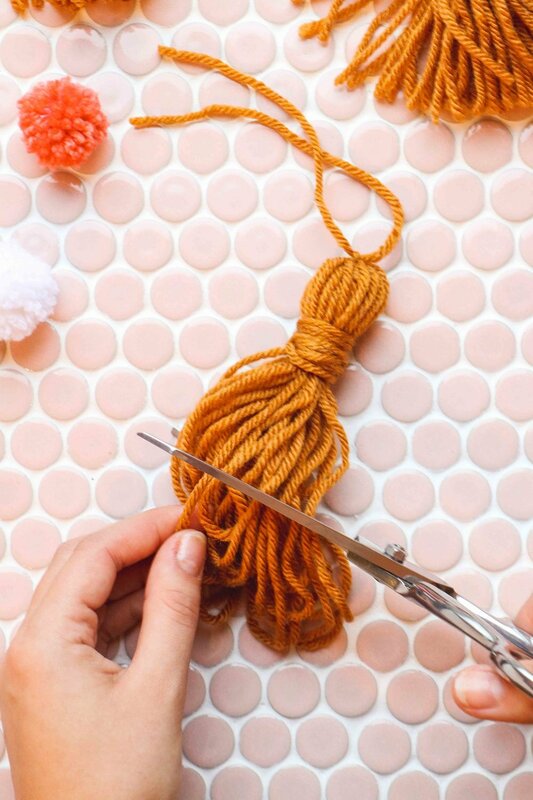 Once your tassel is wrapped, trim the ends so you don't have loops at the ends anymore. And then trim the top strands as short as you can. Next its time to make the pom poms! Start by wrapping your yarn around 4 fingers about 50-60 times. 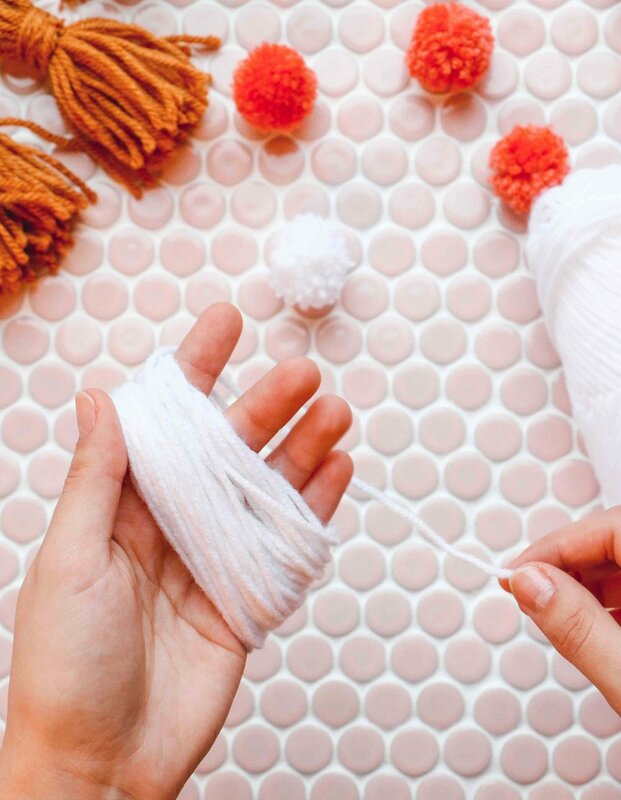 Cut the loops on both sides of the bunch, to create a really messy, uneven ball of yarn. After you have wrapped your yarn, slide it off your fingers and set aside. Cut a strand of yarn (about 6 inches long) and tie as tightly as you can around the middle of the bunch. Then trim your pom to make it the desired size for the scarf. Then its time to pin on the poms and tassels to the desired spots. Then sew on each. Sew through the side of the poms and through the top of the scarf so you don't see the stitch on the opposite side.